To prepare chicken: Thaw chicken in cooler overnight or until fully thawed. To prepare sauce: Pour hot water into mixing container. Pour contents of both packages of Sauce Mix into water while vigorously stirring with a wire whisk. Continue stirring until mix is dissolved and sauce is smooth. Set aside. Divide chicken and peppers evenly among three full size steamtable pans. Pour sauce evenly over chicken and peppers. Place in 350°F convection oven 15 - 20 minutes or until internal temperature reaches 165°F. To prepare noodles: Cook noodles according to al dente package directions. Drain and rinse in cool water to stop cooking. While noodles are cooking, add contents of Noodle Seasoning packets to 3 qt hot water. Mix well and let sauce sit at least 5 minutes. Pour sauce over noodles and toss to coat. Sauce will absorb into noodles. Divide noodles equally among 3 half pans for service. Remove from oven and place product in warming cabinet until served. Ensure that hot food is held at a temperature above 140°F. Serve 1/2 c Asian Noodles with 4 oz Mandarin Orange Chicken. 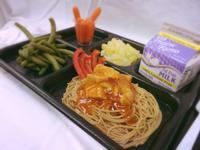 FOR FULL K-12 SCHOOL LUNCH MENU: Serve with green beans, baby carrots, pineapple tidbits and low fat milk to equal 2 M/MA, 2 G/B, 1/2 C Other vegetable, 3/8 C Red Orange Vegetable, 1/2 C Fruit, 1 Milk. Nutritional Information: Calories - 627, Sodium - 708, Fat - 6.16 or 8.8%, Sat Fat - 2.42 or 3.5% when Mandarin Orange Chicken with Noodles is served with sides. AND ADD FOOTHILL FARMS™ PRODUCTS TO YOUR CULINARY ARSENAL TODAY. © Copyright 2019 Kent Precision Foods Group Inc. Foothill Farms is a registered trademark and Flavorwise is a trademark of Kent Precision Foods Group, Inc.